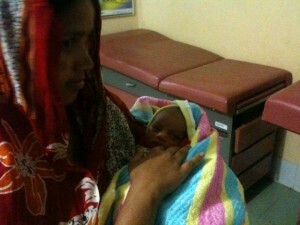 Flashback: Jan 10, 2012-Hope Hospital in Bangladesh. This hospital was established by HOPE Foundation which was founded by my host Hasnain’s friend Dr. Iftikher Mahmoud, a Bangladeshi doctor with a pediatric practice in Fort Lauderdale, Florida. At the CBWC Hospital there are 30 staff and at any given time there are around 70 patients. There are 7-10 births per week and this baby is 3 days old. We visited a couple of wards that are for patients who are unable to pay (there are private rooms for those that are able to pay). I performed some magic and made balloons amongst the beds of recovering women and crying babies. People laughed and everyone seemed glad for the levity and distraction. I wasn’t sure how I was going to go over but people are very accepting and long suffering, and thankfully a crazy clown was not too much of a stretch. The show proceeded to the hallway for doctors, nurses, admin staff and a few women waiting to be seen. All of a sudden half a dozen staff rushed to the ward. Five minutes later a nurse appeared with a minutes-old baby in a small surgical tray and showed us it’s sad predicament: it was an AMLI (absence of limb) baby, missing a leg. It was quite disturbing to see, paricularly because the baby just lie there in the metal tray and everyone was very relaxed and casual…and we were in the hallway. I felt so sorry for baby and parents who now faced a long and difficult road in a land where disabled people are shunned and end up begging for money in stopped traffic (I have seen dozens while here) A doctor told me this was probably a genetic deformity and not malnutrition like the rickets at the facility visited previously on the trip (SARPV Center in Chakuria). Fortunately this family will have access to HOPE Hospital and SARPV for assistance, but sadly so many people in more rural areas have no such facilities. We left after the bittersweet visit, perhaps appropriately in an ambulance, to take to the hotel before the next performance that evening.